In the mid 19th century the Town of Dundas faced two problems: It had been bypassed by the railroads in favour of the City of Hamilton and as a result it was lagging behind economically; and travel to Hamilton was difficult, as Dundas was boxed in on 3 sides by the Niagara Escarpment, and the terrain between the two centres was marshy and crossed by several river valleys. 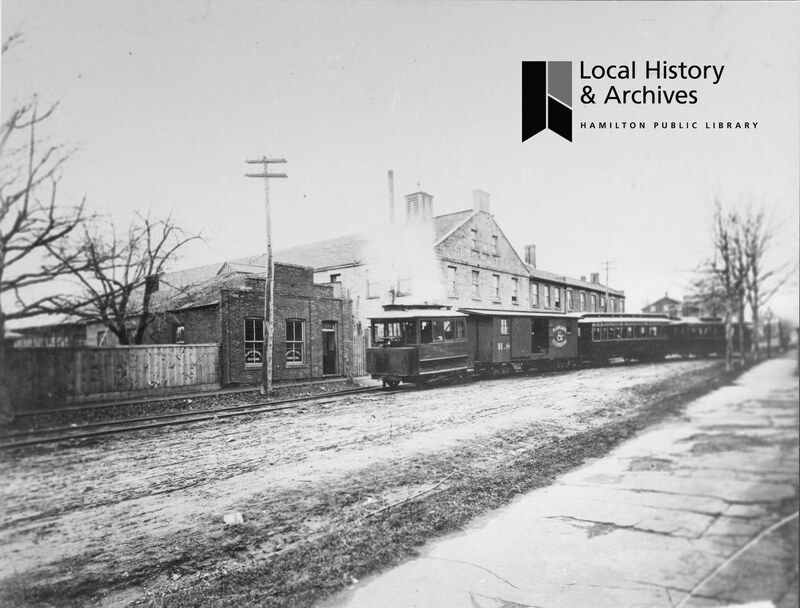 On March 17, 1873, a group of prominent local businessmen held a meeting at the Half-way House, a tavern situated between Hamilton and Dundas, (at today's Emerson & Main St West)) and decided to solve these problems by creating a railway connecting the two communities. Little happened on the project until the spring of 1875, when a series of additional meetings again held at the Half-way House resulted in the creation of an exploratory committee to examine construction and operating costs. Originally the H&D was proposed to run westwards out of Hamilton towards Dundas parallel to the Hamilton & Brantford Road (today's Main Street West). This area was settled with farms, but had two problems. First, climbing in and out of Binkley Hollow (the small ravine west of Main St West & Osler Dr) would have required steep grades or a large expensive bridge. The other problem was that this planned route brought the H&D into conflict with the township of Ancaster. In the fall of 1875 Ancaster upgraded and tolled the Hamilton & Brantford Road, and they objected to the passage of the H&D through this area, as it would siphon off some of their profits. The township forced changes to the incorporation bylaw at the Ontario legislature, and the H&D was incorporated on Feb 11, 1876. The township continued to put up roadblocks to the H&D to the point that the project was considered 'killed off' in the spring of 1876. To avoid problems with the Township of Ancaster, the H&D agreed to alter their route. Instead of running westwards parallel to the Hamilton & Brantford Road, the line would curve northwards west of the Half-way house towards Cootes Paradise, and then turn to the west towards Dundas. This alternative route was proposed as early as the spring of 1875, and had the advantage of shallower grades than the original route, but had no local traffic between the Half-way house and Dundas and higher construction costs due to the swampy terrain. Originally the H&D would only run as far as the Hamilton city limits, that were at that point at Paradise Rd. 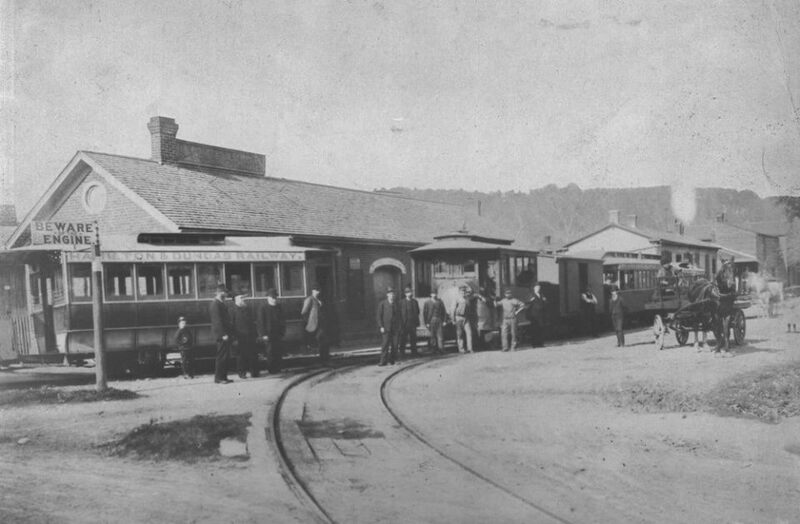 Passengers would then transfer to the Hamilton Street Railway to reach the centre of Hamilton. This idea was abandoned when the HSR refused to extend their line west along King St West from Locke St, and so a route into the city itself was planned. Also, the H&D was planned to be a horse-drawn railway like the HSR was. However, the idea of using small steam engines first appeared in the spring of 1876, and the H&D's charter granted it permission to use motive power other than horses, so long as it had the permission of the local governments. By the summer of 1877 the H&D had decided on a route into Hamilton. Leaving the Hamilton & Brantford Road, the H&D would pass through Ainslie’s Woods, crossing the Chedoke ravine (where Hwy 403 is now) by turning south and descending the side of the ravine, then turning eastwards and crossing the Chedoke river and climbing up out of the ravine. The H&D entered Hamilton on Aberdeen Ave (then called Concession), and then following Queen, Charlton (then called Hannah), MacNab and Main St, terminating beside the Hamilton & Northwestern station on Ferguson Ave. Another option was to build tracks on James which would be shared with the HSR, but was rejected by the HSR who refused to give up their claim on James Street. By the fall of 1877, the grading of the H&D's route had been completed as far as the Hamilton city limits. Three bridges had been built, and Spencer Creek had been channelized along the side of the right of way. However, continued delays by Hamilton City council over approving the H&D bylaw allowing the railway to build and operate within the city limits resulted in all work on the H&D grinding to a halt by mid November. Approval was finally granted on December 18, 1877. Tracklaying on the H&D began on June 3, 1877. Beginning at the Hamilton & Northwestern station at Ferguson Ave on Main St East in Hamilton, work crews headed west towards Dundas. Cars and locomotives began arriving in Hamilton at the end of August, and a test run of H&D #1 was held on the tracks of the H&NW along Ferguson Ave on September 2. The H&D suffered a severe setback on the night of September 12/13, 1877. Torrential rains washed away the trackwork on Charlton Street between Bay and MacNab, and completely destroyed the bridge across the Chedoke Creek. It would be 2 months before the bridge was replaced and the track laid across it. The first test train ran on the H&D on October 9 from the H&NW station to the end of track. Additional test trains ran on November 2 and 13th, showing off the H&D for dignitaries. Grading work on Dundas St in Dundas began on December 20, and work was completed by early March 1879. 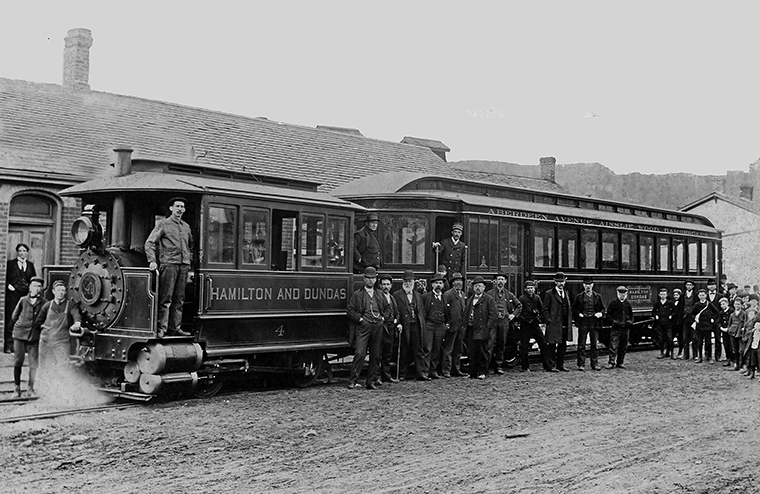 At 3:30 PM on May 16, 1879 the first test train carrying railway officials and dignitaries left Hamilton for Dundas. Pulled by H&D #1, the train was five cars long, four of which were identified as "one being an open summer car, and three obtained whilst quite new from the Fifth Avenue Streetcar Co". The train made only one stop en route, stopping at the Half-way House. The owner Samuel Bramberger made a condition on the use of his property by the H&D that all trains would stop at his tavern for five minutes so he could sell drinks. The H&D agreed, and named the stop "Bramberger's". The train arrived at Elgin House in Dundas shortly after 4 PM. The official opening of the H&D was on May 22, 1879, with the opening train leaving Hamilton at 3 PM. Regular service began on May 23, with the first train arriving in Hamilton from Dundas at 8:30 AM. The H&D discovered their initial schedule of trains every 45 minutes was too tight for regular operations, and so an adjusted schedule was issued the next day. The first weekend saw heavy traffic between the two towns. Because of it’s on-street operations, the H&D originally used three Baldwin-built steam dummies, small locomotives disguised as streetcars so as not to spook horses. These locomotives usually pulled trains of two cars, although trains of up to six cars could be hauled. H&D #2 arrived on May 27th and H&D #3 arrived on October 3rd, while additional cars arrived in August and October 1879. As the 1880s progressed, the H&D turned out not to be as profitable to the owners as anticipated (possibly due to the maintenance cost of running over marshy terrain and fewer customers along its route), and so it was leased out to various operators. Track maintenance does not appear to have been a high priority, based on the H&D's record of derailments that would occur on average a couple of times a month. Fortunately these were minor affairs, due to the H&D's operating speed and the light weight of the locomotives. Taking advantage of the H&D's easy transportation, several parkgrounds opened along the route of the H&D between Hamilton and Dundas. These included Cline Park, and the most famous of all Ainslie Park (the present site of Hwy 403 just north of the CPR's Aberdeen Rail yard) that was the site of numerous large corporate and society picnics. The H&D prompted urban development of southwestern Hamilton along Aberdeen Ave in the 1880s, with developers of the era promoting the proximity of the H&D, as well as the development of the Bramberger property into the village of West Hamilton in 1908. In 1893 the H&D's railway franchise was renewed by all towns and townships along its route. Included in that renewal was a provision allowing for future electrification of the route, subject to the towns' approval. 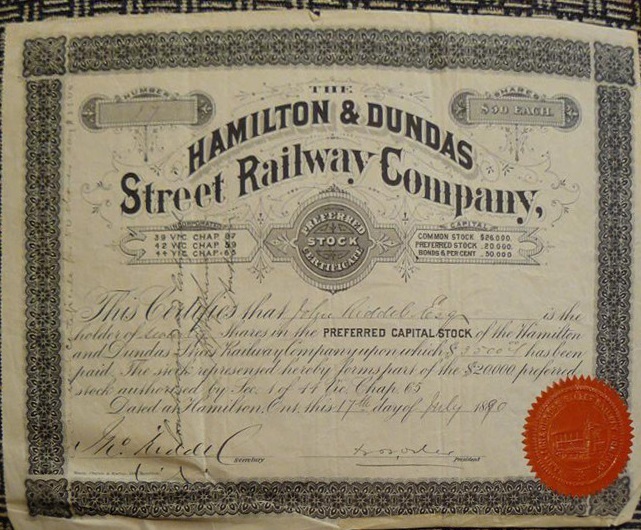 The H&D first looked at electrification in the Summer of 1894, and while preliminary agreements were made with Dundas and Hamilton councils, the H&D could not find acceptable terms with its current leasees. Therefore in September 1894 the H&D decided to postpone electrification until the current lease expired in July 1896. The H&D planned to rebuild its tracks and bridges at the same time. In October 1894 the H&D and the Toronto, Hamilton & Buffalo Railway began talks for the building of a junction between the H&D and the TH&B in West Hamilton, south of the Half-way house, to allow for the H&D to deliver freight cars to the TH&B from Dundas, and vice versa. These talks would eventually lead to the TH&B having trackage rights over the H&D into Dundas, and shipping freight cars in and out of Dundas itself in exchange for an annual payment to the H&D and funding of half of all maintenance costs. Before the trackage rights were settled, the H&D would purchase a new steam dummy larger than the original ones in order to deal with the Dundas freight traffic, and as a replacement due to the age of the original dummies. Serious flooding near Dundas starting on March 29, 1896 resulted in several washouts, suspending service for several days. The resulting expenses resulted in the H&D's plans being delayed several months, with track replacement not begining until October 15, 1896. Track crews were limited to the section of roadbed in Ancaster twp between Dundas and Hamilton, due to proposed changes within the town and city limits that would require the approval of the councils. Starting from the Dundas end, by November 30 the track crews had reached the TH&B bridge over Aberdeen Ave in western Hamilton, where work was halted for the season. Bridge work over Red and Spencer creeks began on March 12 1897, and was completed by July 7. Track work resumed in May 1897, and by May 26 it had reached Aberdeen and Queen, where it was halted until the Hamilton bylaw allowing the H&D to electrify was passed on June 11. A new section of track was built in West Hamilton, bypassing the Half-way house on the west side and heading down to just north of the TH&B main line, before swinging northeast and connecting with the original H&D line at the top of the grade into the Chedoke Valley. This section entered service on July 7, and the bypassed portion of the H&D was abandoned (Although the H&D continued to call the stop in West Hamilton 'Bramberger’s'). Construction of the rail junction was completed on September 24, with the first TH&B train entering Dundas on October 12. All track and electrical work was completed in Dundas by mid-August. In Hamilton the H&D wanted to change its route through the southwestern part of the city, in order to eliminate a level crossing with the TH&B at MacNab and Hunter. It's first attempt to reroute down Queen (passing over the TH&B as it ran through the Hunter St tunnel) and east on Main was disallowed by Hamilton city council. The bylaw passed on June 11 allowed the H&D to use the tracks of the HSR along Queen, Herkimer, & James if an agreement could be reached between the two companies. Two months of negotiations between the H&D and the HSR failed, and so starting on August 25 the H&D began rebuilding the tracks and installing poles along its original route. Track reconstruction to Main & Ferguson was complete by October 2. The overhead wires on Main east of James were attached to the existing poles of the Hamilton, Grimsby, & Beamsville Railway (HG&B), which had been running over the tracks of the H&D since 1895. The HG&B and the H&D would continue to use the same track, but with different overhead wires. A full test of the electric system occurred on October 19. All the equipment functioned properly, but there was a problem. The Hamilton Electric Light & Power Company, which was responsible for the electricity used by the H&D, found that the power requirements were higher than expected, and additional equipment would be needed before the H&D could switch to regular electric operations. Additional feeder wires were installed, and a new electric dynamo was installed on December 22. Electric operation started on January 1, 1898, after which the railway’s fortunes improved to the point of being a source of interest to the Cataract Company, which brought the railway under its control effective September 17, 1899. On December 1, the H&D route was changed so that the cars ran on HSR tracks along Queen, Herkimer, & James to the The Hamilton Radial Electric Railway (HRER) station at James and Gore, which became the new downtown Hamilton station for the H&D. The rails on Charlton and McNab were torn up, and the tracks on Main between James and Ferguson were bought by the HG&B. In 1900 the line was extended west in Dundas along Hatt and Bond St to Fisher’s Mills at King & Bond. The terminus of the H&D changed in 1907 to the new Hamilton Terminal Station on King St at Catherine St. This was now the final route of the H&D, a route that remained unchanged for just over 15 years. After the First World War, improvements to Main St resulted in the formation of a bus route between Dundas and Hamilton. 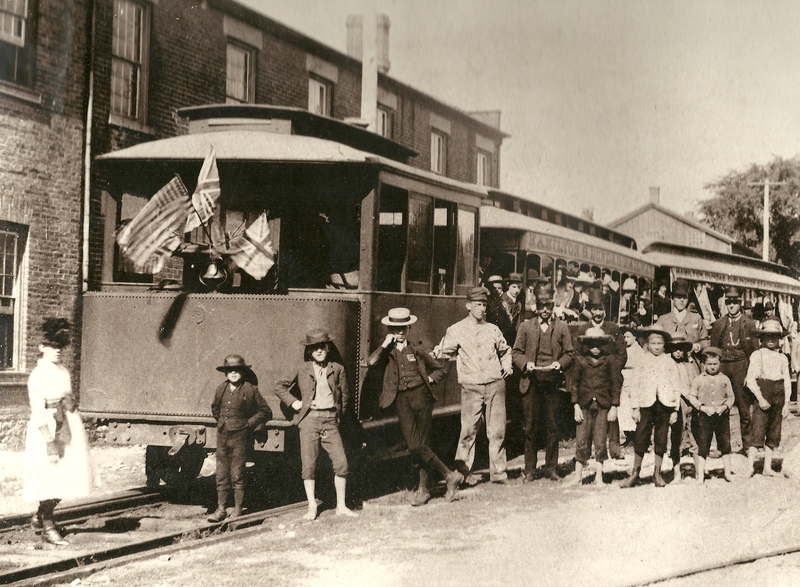 The H&D tried to compete with the bus route by increasing service to West Hamilton using leased HSR streetcars every half hour starting on September 17, 1919. This was unsuccessful, and mounting losses resulted in the H&D being closed down on September 5, 1923. The tracks east of Longwood were taken over by the HSR for streetcar service, and the TH&B purchased the line west of Emerson and into Dundas in 1930. The rails between Longwood and Emerson were torn up in 1944. Streetcar service on Aberdeen was abandoned in the summer of 1941, but was restarted in October 1942 due to the war. The streetcars were abandoned for good in June 1947. The TH&B abandoned the line into Dundas in 1987. H&D Preferred Stock Certificate, issued to John Riddell on July 17 1880. John Riddell was also the secretary of the H&D, as shown by his signature in the lower left corner. Ticket used on H&D. The signature is of manager C. K. Green, which dates the ticket to between 1903 and 1906. 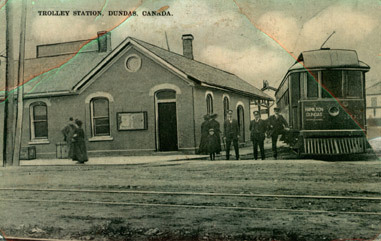 H&D #3 at the H&D's Dundas passenger station circa 1886. On the left is car #51, originally a horsecar from New York City. Behind the steam dummy is one of the H&D's boxcars and either car #16 or #18. A closeup of H&D #51. H&D #20 with steam dummy #4 at the H&D Dundas passenger station. Built by the Toronto Railway Company in 1896, the unpowered trailer would later be converted to a self-propelled combine. When the H&D was taken over by the Cataract company in 1899, #20 was renumbered to #120. It was then renumbered to #220 in 1901 after the takeover of the HRER, and was given its final number as #181 as part of the Cataract company‘s system-wide renumbering in 1910. It was scrapped in 1933. Photo postcard of an HTC 1913 Preston-built radial car at West Hamilton station on the H&D at Christmas 1918. 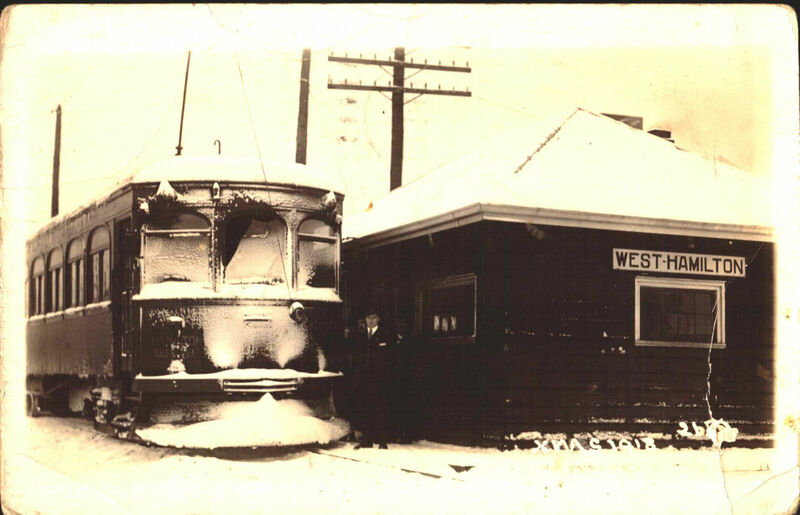 West Hamilton station was on Emerson St, now the site of Aitchison Lumber. This photo postcard was actually used, but strangely enough it was mailed in 1949-more than 30 years after the photo was taken. 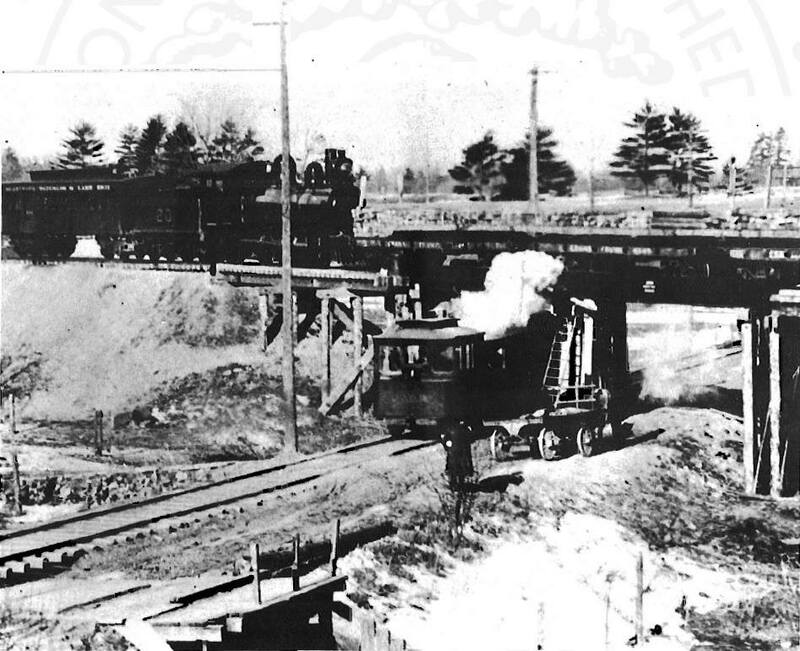 A H&D train passes under the brand new Toronto, Hamilton & Buffalo bridge over Aberdeen Ave in late March of 1895. On top of the bridge is a construction train laying the tracks of the new TH&B railway line between Brantford and Hamilton. TH&B #20, a 4-6-0, was built in 1894 by Schenectady. Behind the steam locomotive is a combination car lettered for the Brantford, Waterloo & Lake Erie Railway. This is the only picture which has yet come to light showing this TH&B predecessor. What you're looking at is a photo of an engineering screw up. The TH&B bridge over the H&D only had about an inch of clearance for the H&D locomotives when it should have had over a foot. Likely someone misread the drawings. The bridge was so low that the H&D locomotives had to remove their whistles to fit under. After almost two months of arguing, the TH&B paid for Aberdeen Ave and the H&D to be dropped down to improve the clearance. The H&D’s fleet of steam dummies are described here, and the fleet of H&D cars are described here. Copyright © 2001-2018 Tom Luton. All Rights Reserved. | hamiltontransithistory@rogers.com | Last updated July 1, 2018.